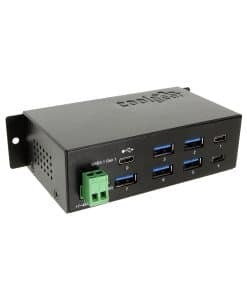 This USB 2.0 Mini 4-Port Hub is a high-speed rugged mountable hub compact enough to be mounted in small areas where space is an issue for USB connections. Rugged and Mountable for USB 2.0 Applications. Compliant with USB 2.0 specifications for High-Speed data interface. This product has been designed to be connected to a computer with a USB 2.0 interface. It serves to connect up to 4 additional USB devices. The USB 2.0 Mini high speed hub is bus powered but can be self-powered with an additional 5V AC power adapter included.